Formally known as Mount Ophir, the picnic area at the foot of the mountain is a very popular picnic spots with residents of Southern Peninsula. 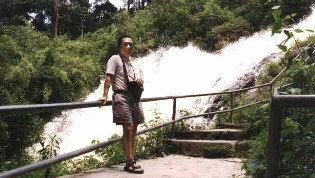 The mountain itself offers its visitors night trekking, mountain hiking apart from the picnic areas for the family. There are two approaches to the summit and both are quite well marked. As this is a single outcrop with no other mountain range, chances of getting stray is remote. 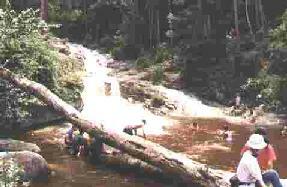 As the start of the climb, there is a series of tall cascades pausing with small pools, ideal for bathing. 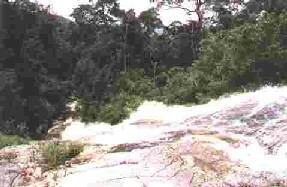 From this point up there are 4 notable cascades all between 5-8 meters tall. This single cascade, the tallest and only one worth mentioning is about 100 meters tall. Standing at the bridge on top of the first fall and looking down from this dizzy height offers a panoramic view of the lower reaches. The Parks authority provided reliable walking paths, steps and guardrails where appropriate. The whole surrounding is gradually upgraded into a fall fledge vacation spot with stalls, changing rooms and chalets. 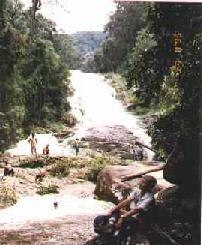 This is a view of the long cascade as seen from the level ground at the base of this waterfall. For the park management, there are still lessons to be learned from officials up north in Kedah, who have kept Bukit Hijau and Assam Jawa in mint conditions. Perhaps there should be a gauge to grade parks after all?